How to navigate the Mobile device with mouse or keyboard of the PC in SideSync? Customers can control mobile devices through same way with the mouse or keyboard in both screen sharing mode and keyboard and mouse sharing mode. 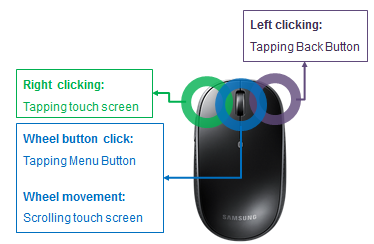 Each button of the mouse works like specific actions in real device. Customer can navigate the screen with arrow buttons. 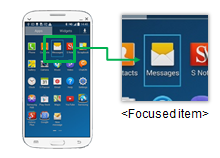 In this case, blue square box is displayed around the focused item.